A simple and fun craft to hang proudly on your door (whether you’re a kid or a teacher)! It’s time to divulge the other DIY craft in our Undersea Treasure Basket! It goes perfectly with the DIY Undersea Treasure Chest we recently posted, and would be adorable to add to a kid’s ocean themed room. 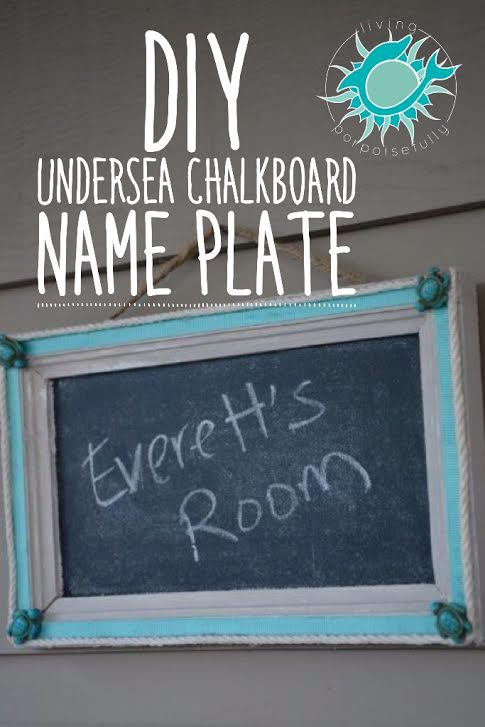 It’s a chalkboard name plate, and also doubles as a fun craft to do as a family or as a personalized gift for a special girl or boy! It was so much fun to make, and is so stinking easy to customize it with different paint, ribbon, or beads. In fact, I may just have to make another to hang on the door of my classroom (teacher gift, yes please!). We made ours with many of the same materials as the Undersea Treasure Chest: gray chalky paint, aqua ribbon, thin craft rope, and turquoise sea turtle beads. So without further ado, here’s the easy and stress free how-to guide. Enjoy! Cut the ribbon so that it is the length of one side of the frame. Use tacky glue to glue it down the center of the plank, smoothing and straightening it with your fingers. Repeat for the remaining 3 sides. Use a hot glue gun to attach the thin craft rope around the border of the frame. Attach a sea turtle bead to each corner with hot glue. Complete the name plate by writing your name with chalk! Hang on your door using a sticky hook. We’re sharing the rest of the gift basket ensemble very soon — we can’t wait for you to see it all together and get ideas for an ocean style Easter basket!